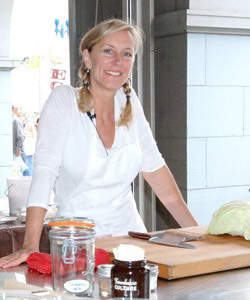 At the Ferry Plaza Farmers Market, farmers and food artisans are taking strides to make their businesses more environmentally and economically sustainable. Here are a few of their in-progress projects and renewed commitments for the new year. 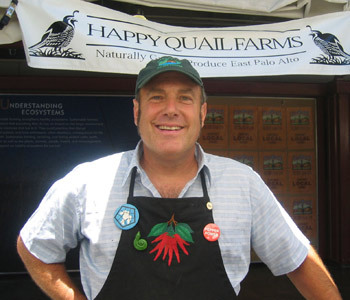 Having trucked more than 50,000 miles on their electric Ford Ranger through markets and deliveries over the last six years, the folks at Happy Quail Farms aim to further reduce their eco-footprint by going solar on the farm. “Not only will we not be burning any gas on the road, but we’ll also be generating most of our own electricity with solar power from our roof,” said Happy Quail’s David Winsberg. He’s also experimenting with using tobacco tea for insect control, reducing the farm’s need for commercial sprays. Frog Hollow Farm is partnering with Dr. Gordon Frankie, a professor and entomologist at UC Berkeley, in a 10-year experiment to establish native bee habitats on the farm. The goal of the project is to shed light on methods for attracting alternative pollinators in the wake of colony collapse disorder (CCD), which has decimated domestic honeybee colonies over the last five years. With more than a third of the world’s agricultural production of fruit, nuts, and vegetables depending on pollinators, native bees have a crucial role to play. So far, 46 species of native bee species have been spotted at Frog Hollow. As controversies about extra virgin olive oil production heat up, Bariani Olive Oil is deepening its commitment to authenticity and quality. Sebastian Bariani will be traveling to Italy’s Organizzazione Nazionale Assaggiatori Olio d’Oliva (ONAOO) to take a technical and practical course in cultivation techniques, and a certification course to become an expert olive oil taster. This year, Saint Benoît Yogurt becomes Saint Benoît Creamery. 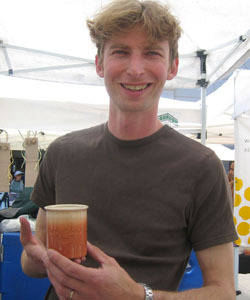 By February, they are planning to add organic, low-heat-pasteurized, non-homogenized milk to their product line, making them the only milk seller at the Ferry Plaza Farmers Market. Saint Benoît is partnering with fourth-generation farm Diamond M Dairy in Petaluma to process and bottle whole milk from pasture-fed Jersey cows—in reusable glass bottles, of course. “By low-heat-pasteurizing, we keep the milk as close to its original state as possible, avoiding extensive processing and a ‘cooked’ taste,” says founder Benoît de Korsak. And the creamery is located just a mile from the dairy, so the milk doesn’t have far to travel from farm to bottle. 2012 is all about water for Far West Fungi. The Garrones are in the process of working with state and coastal agencies to secure permits for digging a new well, which will help mitigate coastal salt water intrusion. They’re also planting crops such as peas, pumpkins, and corn to recycle some of their mushroom irrigation waste water. Change is fermenting at Farmhouse Culture. They’re outgrowing their current Santa Cruz kraut-making facility and looking to expand, ideally relocating to a spot that is closer to farmland. They’ll also be releasing a number of new krauts and fermented veggies in the coming months, including Cauliflower Curry Raisin Kraut, Ginger Beet Lavender Kraut, and a much-anticipated kimchee. Lacto-fermented Ginger Lemon Carrots will be their first foray into non-kraut vegetable fermentation. At CUESA, we are continuing our commitment to cultivating a sustainable food system by supporting local food producers in their efforts while offering engaging educational programs at the market and beyond. In 2012 we plan to step up our participation in food policy advocacy, expand our Schoolyard to Market program to a third high school, and extend wireless coverage throughout the farmers market so that all sellers can accept credit cards if they wish. We are planning more new initiatives—to be announced after a CUESA planning retreat to be held later this month. You can learn more about our guiding principles in CUESA’s Sustainability Frameworks.